BHG is offering you the chance to win a rug for every room. 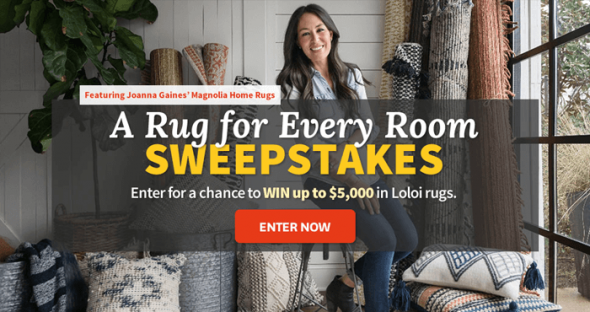 When you enter the Sweepstakes at BHG.com/LoloiRugs now through the end of the year, you could win up to $5,000 in Loloi Rugs featuring Fixer Upper’s Joanna Gaines’ Magnolia Home Rugs. During the Sweepstakes Period, visit www.bhg.com/loloirugs and follow the instructions provided to submit a completed online entry form to receive one entry. Each valid entry form submitted will result in one entry. One winner will win up to $5,000 worth of rugs from the Loloi Rugs Magnolia Home Collection by Joanna Gaines. Approximate Retail Value of the prize is $5,000. The BHG A Rug for Every Room Sweepstakes is open to legal residents of the 48 contiguous United States and the District of Columbia, excluding Alaska and Hawaii, 21 years of age or older. Begins at 12:01 a.m. CT on October 1, 2016 and ends at 11:59 p.m. CT on December 31, 2016. There is no limit to the number of entries each individual can submit throughout the Sweepstakes Period however you may only use one email address to enter this Sweepstakes. On or about January 9, 2017, Sponsor will conduct a random drawing from among all eligible entries received to select one potential winner. For the name of the winner, available after 01/31/17, send a separate, self-addressed, stamped envelope to Winner’s Name, A Rug For Every Room Sweepstakes, 1716 Locust St., LS-321, Des Moines, IA 50309. This Sweepstakes is sponsored by Meredith Corporation, 1716 Locust St., Des Moines, Iowa. For more information on the BHG A Rug for Every Room Sweepstakes, including official rules, visit www.BHG.com/LoloiRugs now!